Golspie is known for its award winning public conveniences, but it also has several of heritage interest. 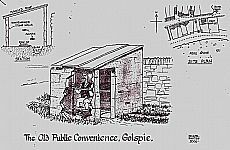 This drawing represents a public convenience which was situated over Allt Sagart (Priest's Burn) in Golspie. It was built in the late 19th century, and demolished after the second world war. This illustration, drawn by Michael Simpson, was based on detailed information given him in 2000 by W.R. Sutherland. A similar one was built over Meg's burn for the use of gardeners at Dunrobin Castle, but was not a public facility. There the burn was diverted to accommodate the facility. 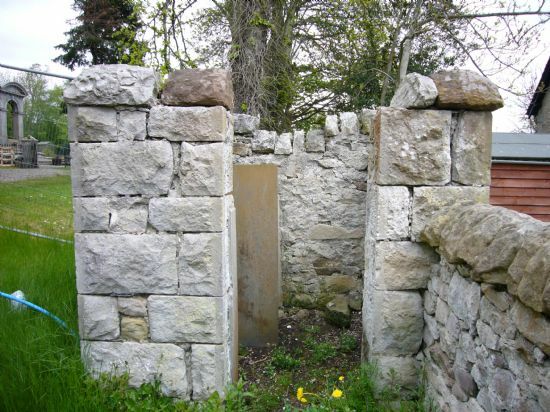 The photograph shows another public convenience surviving in Golspie, built in 1906 as a facility for the new United Free Church in Fountain Road, forming part of the south boundary wall. It is constructed from the same stone as the wall and the church, and contains two male urinals. There is no sign of water supply or drainage. A third facility was built as part of the Golspie Inn complex in 1808. 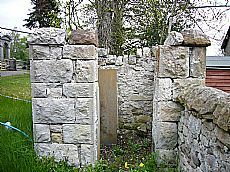 It survives as a simple refuge with no fittings or water supply, situated between the Inn coaching house and the steep bank behind, its stonework being continuous with the retaining wall. These sites were researched as part of ARCH's Community Timelines course by Michael Simpson. The results of the course can be seen in a display which is touring Golpie this summer at Dunrobin Castle and Golspie Heritage Society (contact the Golspie Heritage Society for its current whereabouts). Binders with more details are available at the Heritage Society and Golspie Library. There does not appear to be much research on these necessary public facilities, but many communities probably had similar. Participants on ARCH's Black Isle Heritage Memories sessions remembered one also situated over a burn in Avoch. Do you remember any in your commmunity? If so, join the ARCH website forum and let us know about them.